Vegas is the quintessential location for an unforgettable bachelorette party. With so many ways to mark the occasion, celebrating the last moments of singledom can be tailored to each bride’s individual style without coming off as cliché. So, start planning, gather the ladies, and get to making some lasting memories. For the bride looking to relax and rejuvenate before the big day, recharge with the girls during an unforgettable spa day. Qua Baths and Spa at Caesars Palace offers everything you would expect at a spa, including the award-winning Nobu Nagomi Ritual, which is said to increase relaxation, flexibility and energy flow. Who doesn’t need that? After an invigorating spa treatment, lounging around in a fluffy robe is the move. Suites at Palms Casino Resort are cushy retreats, and you can enjoy culinary delights without ever leaving the room, ensuring girl talk is never interrupted. When it’s time to hit the town, the low-key queen will appreciate that you’ve opted for a personal cooking class with chef Julien Asseo in the kitchen of Restaurant Guy Savoy at Caesars Palace. Learn how to create an appetizer and entrée from one of the greats, then sample your delights afterward. Every party girl knows that the best adventures start with brunch. Head to the terrace of LAVO, located at The Palazzo, to enjoy the views while noshing on items from an eclectic menu of brunch staples and Italian specialties. After a catnap, and maybe a shopping trip, nab reservations for the whole crew at STK at The Cosmopolitan of Las Vegas. On top of decadent steak, the posh restaurant also offers inventive cocktails and a live DJ to get the party started. No real Vegas party would be complete without heading to the club. Hakkasan inside MGM Grand is one of the Strip’s trendiest and largest nightclubs. The multi-tiered venue is equipped with state-of-the-art sound and world-renowned DJs to keep the dance floor on fire all night long. For the modern woman who knows exactly what she wants, it’s essential to make an appearance at all of Vegas’ newest and hottest locales. Start the morning off with brunch at Pronto by Giada inside Caesars Palace. Build your own delicacies with self-service omelets, fine meats or desserts, and don’t forget to indulge in a bottomless package that will ensure that your glass never runs dry. When the crew gets hungry midday, the options are limitless. But for the girl who’s always in the right place at the right time, Eureka! is the spot. Located in uber-hip Downtown Las Vegas, the industrial-styled restaurant delivers craft beer, small batch cocktails, and American staples for a low-key, effortlessly cool lunch. Vegas is a sportswoman’s paradise, so for the bride who is the ultimate fan, there’s plenty to cheer about. Of course, any sports fan would delight in a night at T-Mobile Arena to see the beloved Vegas Golden Knights as they hit the ice. After the game, stroll The Park to Beerhaus to enjoy cold brews while watching the highlights on the big screens. The spacious patio makes for great people-watching too. If the bride-to-be would rather participate than appreciate, book a bay at Topgolf. With private bars, plenty of seating and great music, the whole crew will make it to the tee, even if all they can do is slice. 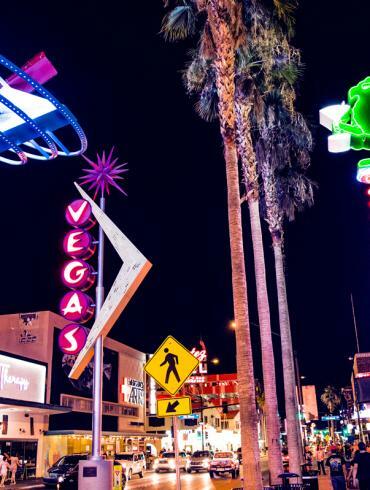 Glamorous gals will feel right at home on Vegas’ bright and shimmering streets. Make the future bride feel even more elegant with a treatment at The Spa at Encore. Upon entering the enchanting space, a mixture of decadence and relaxation will take over before the pampering starts. The Shops at Crystals takes opulence to the next level. From designer brands to the breathtaking architecture, it’s impossible to feel plain while shopping inside CityCenter. As the sun sets, the posh Electra Cocktail Club comes to life in The Venetian and offers a chic aesthetic that complements the bride’s fashionable clique. The drinks are pretty classy too. A future bride that prefers adventure will find adrenaline rushes around every corner. Rather than simply walking or driving down the Strip, see the lights from above on a Maverick Helicopter Tour. If that’s not enough, you can also explore the depths of the Grand Canyon. If sightseeing is not enough, Valley of Fire State Park is only a short drive from the city. On top of breathtaking rock formations and challenging hikes, document the occasion with phenomenal photo opportunities. Punctuate the momentous occasion with an exhilarating soar over the LINQ Promenade or the resort’s latest attraction, Fly LINQ (opening November 2018). 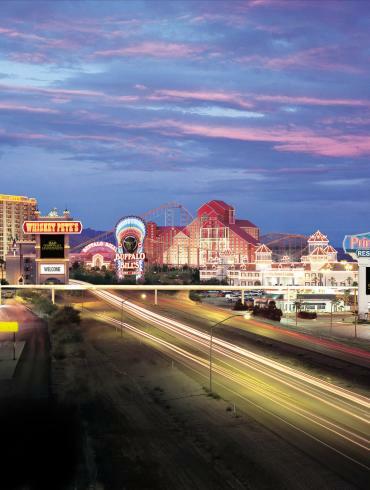 In Vegas, bachelorette parties are anything but mundane. Craft an ultimate last hurrah to fit any style.